The first part of a long, hypothetical example of play. Yes, we may eventually get together and play this out, but I expect it will work out quite differently than this example. Dev, Jen, Eben, Shreyas, Elizabeth, and Jonathan are playing the new version of the Avatar game set during the events of a hypothetical Book 4: Air. Eben decides to play Toph, since she — unlike Aang and Zuko — doesn’t have huge responsibilities at the end of Book 3 that would prevent her from adventuring. Jen decides to play Sokka, because he’s hilarious and is the kind of person Aang is likely to trust with the mission to discover what happened to any surviving Air Nomads and sky bison. Elizabeth considers playing Suki, because she’s a great foil for Sokka, but ultimately decides that the two characters are ultimately more interesting when they’re not together, because they’re more badass and less clingy. She decides to play Suki whenever she shows up, but that Suki won’t be a major character featured in most of the episodes. Shreyas decides to play Azula, who is sure to escape from prison and cause all sorts of problems. She might even know what happened to Ursa, her mother, and therefore be a great foil for anyone attempting to discover her whereabouts. But Shreyas also wants it to be possible that Azula might eventually be redeemed like Zuko was in Book 3, that she won’t eventually end up desperate and alone. Dev, Elizabeth, and Jonathan ultimately decide to not chose major characters at the beginning, but perhaps decide on them as play progresses. After all, when Toph first appears in “The Blind Bandit,” it’s not immediately clear that she’s going to join the team. The three main kids — Aang, Katara, and Sokka — have met plenty of other kids along the way (including Zuko) and have never added a fourth to their family. So new characters will be encountered in every episode and, if they seem like the kind that would join up with the main characters, then Dev, Elizabeth, or Jonathan might step in and decide to play one in an on-going fashion. Here’s what I’ve been thinking about for the “Book 4: Air” game Dev’s talking about organizing, inspired by my original Avatar rules, Mist-Robed Gate, and In a Wicked Age. A large version of the elemental chakra from the old character sheet is placed in the center of the place space. 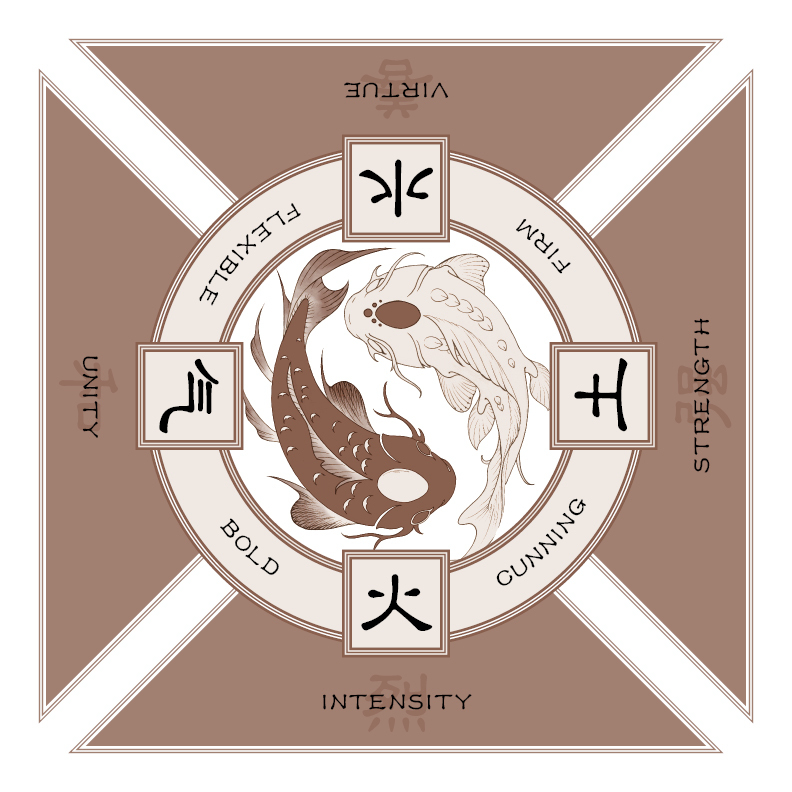 All the major and minor characters in the game each have a figurine or pawn that is placed somewhere on this chakra, on one of the four elements. Characters that are not active in a particular episode are pushed off to the side, in a “holding area” next to the element they are currently on. Next to each element is also a bowl of tokens that share the traditional color of that element. Play consists of pursuing progress along dharma paths of various scope. Generally speaking, you advance along urgent dharma paths at the end of an action or series of actions, you advance along lesser dharma paths at the end of a scene or by resolving an urgent dharma path, and you advance along a greater dharma path at the end of an episode or by resolving a lesser dharma path. Once a path has reached a natural conclusion, the group either negotiates an appropriate result, “You manage to escape from Azula, but you know it’s only a matter of time before she finds you again,” or can choose to randomly draw one of the tokens placed on that dharma path. Before drawing, the group should collectively choose which character must ultimately make a choice as a result of this dharma path (whose dharma is this, really?). Once a token is drawn, that character’s figurine is moved to the same element as the token that is drawn and that character’s player narrates the character resolving the conflict by making a choice based on that element. Afterwards, however, the Fire token that I would normally put on the associated path (for making the choice) doesn’t have a path to go on, since that path’s been resolved. Instead, I place the token on a path one level higher in scope, a lesser dharma path, to indicate progress on one of the major themes or issues of the current episode. Perhaps I place it on “You Win Some and You Lose Some,” indicating that Zuko has become even more angsty and jaded about his life. When adding tokens and making progress on lesser or greater dharma paths, players should probably jot down a few notes on the card, indicating how progress was made. Since, unlike urgent dharma paths, lesser and greater paths are not resolved in a single scene — or even several scenes or multiple episodes, in some cases — and it can consequently be difficult to remember what the last bit of progress on a given path was. Generally speaking, each step along a path should build on previous steps, even if different characters are cooperating on or struggling over the same dharma path. Like everyone has said, Mike Mearls talking on Theory From The Closet is really good. Clyde tries his best to keep up with him and the questions actually get better as it goes on. Very cool. SPOILERS FOR PEOPLE WHO HAVEN’T WATCHED SEASON 3!!! Aang is busy being the Avatar, while Zuko is busy being Fire Lord, but they each have a mystery that needs solving. Aang wants to know if any Air Nomads or sky bison survived the Fire Nation’s genocidal attack and, if so, where they might be. Perhaps they hid among the other three nations, hiding their identities, intermarrying, having children, but secretly preserving some relics of their heritage. After 100 years, it may be difficult to discover the truth but, if balance is to be preserved in the world, there must be Four Nations, not three. (Yes, a bunch of awkward questions about intercultural identity, the “rightness” of resurrecting a lost culture, and what it means to be an Air Nomad these days if you can’t airbend!) Zuko, on the other hand, is more interested in discovering what happened to Ursa, his mother and the former queen of the Fire Nation, which of course is related to the surviving Air Nomads / sky bison. Since they and their close allies (the main characters from the first three seasons) cannot undertake these missions themselves, they have entrusted them to some other kids — the player characters — who can include both minor characters from the series (Haru!) and some the players make up. We talked a bit today about hacking my original rules together with Shreyas’ Mist-Robed Gate to make a set of guidelines that we’re happy with. I’ll try to post about those sometime soon. Now that Geiger Beta is out, it’s time to take a break from that and give people some time to play it and make comments. Which means I can finally think about other things. Dev recently said that he wants to play the Avatar game, which means I need to tweak it a bit. I might just end up blatantly stealing the fight mechanics from Mist-Robed Gate, because I think they’ll work mighty well. Then a few other tweaks and we’re off. The Avatar game still gets the most hits of anything on my website, so perhaps I should just release it through Bleeding Play in PDF form, once we playtest it a bunch more. Push is definitely near the top of the list. I want to get the other articles from Push 1 up in HTML format on Bleeding Play, make the link to the PDF more prominent, type in the edits to her article that Em sent me months ago, and get Push 1 set up on Lulu so people can order print copies at cost. I also want to start getting some of the stuff from Push 2 up. Eero and Bill’s articles in particular are things I’ve been sitting on for many months. I just need to edit them, ask for a couple corrections from the authors, and post them up there. Currently, it looks like Transantiago development may move to Secret Wars for a bit, since Shreyas has agreed to help me work on the passages from the rules that are supposed to be read aloud during play. And then there’s Fingers on the Firmament, which I’ve been thinking about a ton and can’t wait to get to. Development-wise, I think it comes right after Transantiago, since Justin is still focused on getting the John Rain game done. It will rock some serious socks. Honestly, after playing 4th some more, I’m also interested in seeing the changes they’re coming out with for the GSL, on the outside chance that Firmament might be able to mine some of the better parts of the new edition. We’ll see. Elliot Wilen and I have been having a pretty cool discussion over here. I feel not entirely qualified to speak authoritatively on this subject, since I wasn’t at GenCon to take the current pulse of the post-Forge community. Honestly, the excitement and sense of connectedness that followed GenCon this year seems stronger than ever before, which I find encouraging in a time when design and play preferences seem to be diverging. – the new play sheet as a separate download, now with 100% fewer bears! I apologize for the typos in the edition I got out for GenCon. Apparently (and unsurprisingly) making last minute edits and additions directly into InDesign is fraught with danger. The new text is functionally the same, however. There are no content changes. Also, while I was updating things, there’s a new page explaining what Bleeding Play is all about. Just confirmed by phone with Nathan: Geiger Counter is now available at the Design Matters booth, for free (with the purchase of two other games or if you play it with someone else at the con)! Get one while they last! The PDF of the new version is right here. Unfortunately, because I underestimated Kinkos’ ability to print and overnight the hard copies in the same day, they’ll be heading over to Indianapolis first thing in the morning, so they may not be at the Design Matters booth until Friday. Hopefully the fact that it’s free will make up for any wait. Just wanted to let folks know. Due to some personal issues that recently came up (nothing really bad, but not something good either), I’m not going to be able to attend GenCon as planned. There are just more important things that I need to deal with here that trump all other concerns. Hopefully, the Geiger Counter beta will still be available through a promotion at the Design Matters booth (buy two games there, get Geiger free). Also, if anybody plans on running Geiger Counter at GenCon — John, Lukas, Ben, Ping, etc. — you might try to talk to someone at the DM booth first, since they should be able to hook you up with copies of the beta to hand out to folks who play it and dig it. That all assumes that I can finish the final layout for the beta today, get it printed at Kinkos, and get the copies in Nathan Paoletta’s hot little hands before he starts driving to Indy. If that doesn’t happen, I’ll find some other way to distribute them. I’m mostly sad that I won’t be at GenCon to see all the folks I only get to hang and play games with once a year, plus meeting all the new folks that I haven’t met yet. Oh, and I’ll miss playing Transantiago. The sales and marketing aspects of the con, plus the general insanity and stress, are things I won’t miss. This was going to be my last GenCon for a while anyway, so I was preparing for the separation anxiety, in a way. I just wasn’t prepared for it to happen this soon. Hopefully I’ll be able to use it as an opportunity to remember why I’m really excited about making and playing games and continue reconsidering how I will continue to do that in the future. Since I’ve decided to go the hobby-not-business route, GenCon probably isn’t the best choice for distributing and promoting free games anyway, though I originally rationalized going again this year as a kind of transition. In any case, I wish those who will be there the best of luck, especially my Design Matters compadres, who I’m sure will destroy all monsters and maybe some sucka MCs on the side. Also, there’s some great folks like Shreyas and Elizabeth and Rob Bohl and some other cats who will have their first games out. Very exciting stuff.